Making a New Year’s resolution to get organized is a great thing to do. This helps you get rid of clutter and get your home or apartment in order, which can ease stress and provide a more relaxing living environment. 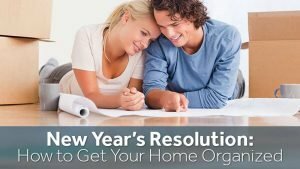 Use the following tips as you organize your home in the new year. Organizing your home can be an overwhelming process if you have a lot to go through. You can make it easier on yourself by focusing on one room at a time. Choose one room to start with, and take the time to sort through every item in it. When you’re done with that room, move on to the next one. You might want to start with a room that’s smaller and usually has fewer items in it, such as a bathroom, rather than starting with a kitchen or bedroom filled with more items. 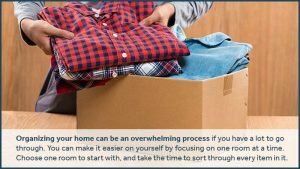 As you go through everything in your home, you’ll need to decide if you want to keep items, give them away or throw them out. Keep in mind that you don’t have to necessarily throw out unused items or ones that you don’t use often. Instead, you can use storage solutions to keep these items organized and out of the way. You should toss items that are beyond repair, worn out or generally in poor condition. Items that you don’t want to keep that are still in good condition can be donated. Having items scattered around your home in drawers, countertop piles, side tables and other areas makes it hard to stay organized. You might also have trouble finding a particular item you’re looking for. You can avoid this by making sure that every single item in your home has a specific spot to go in. This helps prevent clutter from building up again. For example, you can place a bowl close to your front door for keys to go in when you get home. If you want to clear up space in your home, consider looking into long-term storage solutions in your area. You can use your storage rental for items you don’t need on a regular basis, such as seasonal items, or use it for storing collectibles that you don’t necessarily need to keep around the house. Using secure, long-term storage solutions helps reduce the risk of having your home become disorganized again. You’ll also have more space inside your home, which prevents it from looking cluttered. If you need storage solutions for your home this year, contact us at Zippy Shell Greater Columbus. We provide affordable storage services for all of our customers. Whether you need short-term or long-term storage, we’re here to help.